Justin’s note: Casey Research friend Jeff Brown is the editor of Exponential Tech Investor… and one of the best tech analysts I know. He has an inside track on the biggest technology investing trends – and it shows. 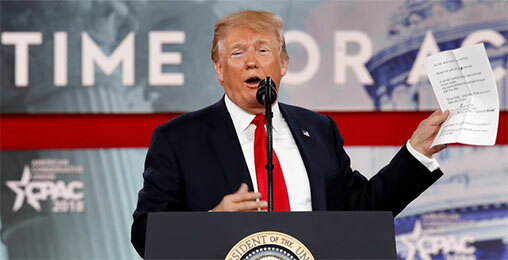 His track record includes successfully spotting the best-performing S&P 500 stocks of 2016 and 2018. In other words, when Jeff writes… it’s profitable to pay attention. Today, Jeff gives readers a sneak peek of the smartphones of tomorrow… and reveals why it spells trouble for Apple and its iconic iPhone. Last month, the GSMA Mobile World Congress was held in Barcelona. Mobile World Congress (MWC) is one of the biggest technology events of the year… It’s where companies gather to showcase their latest and greatest products. The notable exception is Apple, which always hosts its own product reveal events. The mobile phones showcased there typically go up for sale later in the year. In recent years, MWC has been something of a letdown. As my regular readers know, recent smartphone innovations have been disappointing. There’s been a bit more memory, a faster processor, and better-quality resolution in the cameras, but nothing revolutionary. We got our first glimpse of what will be the future of mobile devices. And I believe it spells big trouble for one of the most iconic devices in history: Apple’s iPhone. As I mentioned above, recent smartphone innovations have been a bit of a disappointment. 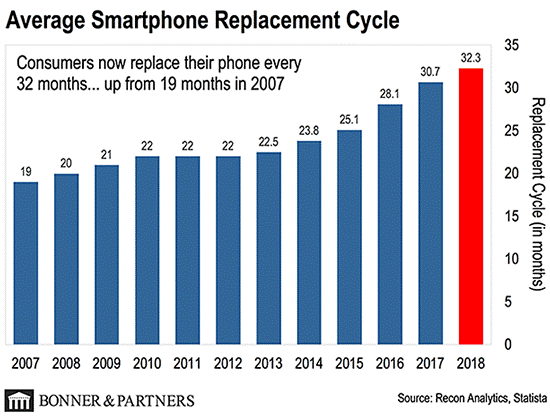 In 2007, when the very first iPhone was released, consumers were replacing their mobile phones just about every year and a half (19 months) on average. From 2007-2014, this replacement cycle remained under the two-year mark. Last year, the cycle was at its longest ever – 32 months. So why are consumers holding onto their smartphones longer? Simple: The newer models aren’t innovative enough to compel consumers to run out and buy them. The new phones just don’t do much more than the old ones. And smartphones are expensive, after all. We’ve been waiting for something big… and that something is now here: At MWC, we got our first look at 5G-enabled mobile phones. Huawei, Samsung, LG, and Chinese mobile phone producer Xiaomi all previewed smartphones that were able to operate over 5G networks. The Huawei Mate X and Samsung Galaxy Fold phones even have screens that fold, so the mobile devices can essentially transform from smartphones to tablets. 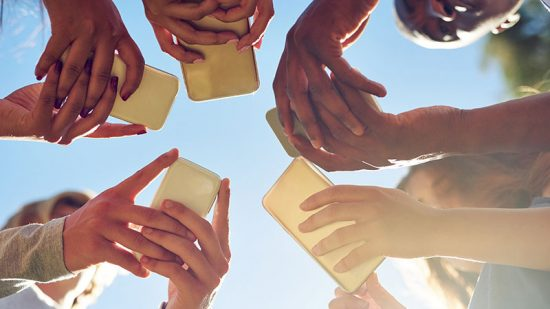 Why do I believe billions of consumers will rush out to purchase 5G-enabled phones? Well, aside from being able to use next-generation applications like augmented/mixed reality, there’s one simple reason… Today’s networks are jam-packed. Have you ever tried calling somebody, but the line kept dropping unexpectedly? How about trying to send a text message, but it repeatedly fails to go through? Or how about when you try to open a web page on your smartphone, but the page simply won’t load? These sorts of problems are almost always caused by network congestion. Just like how you experience traffic congestion on a busy road, mobile networks experience congestion when too much data is traveling over the network. You can see how voice traffic has remained flat over the years. But look at the levels of data operating over our current networks. 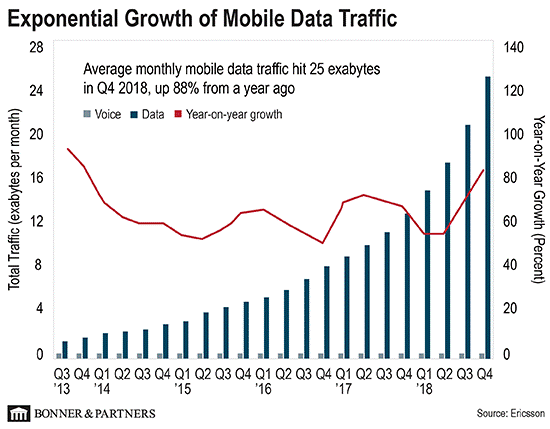 As of Q4 2018, monthly mobile data traffic averaged 25 exabytes per month. What’s an exabyte? One exabyte is equivalent to 100,000 times all printed material in the Library of Congress. I know… It’s hard for us to get our heads around how much information that is. The Q4 2018 figure is 88% higher from where it was in Q4 2017. Data traffic nearly doubled in a year. And it’s only going higher from here. Our current 4G networks simply aren’t able to process that much data efficiently. And that’s where 5G comes in. For a full recap of 5G, you can go right here. But for now, just know that on average, 5G will be 100 times faster than our current 4G networks. With that kind of speed, dropped calls and slow-loading web pages will be a thing of the past. You could download a two-hour movie in seconds. 5G isn’t just evolutionary – it’s revolutionary. That’s why consumers will rush out to buy new 5G phones. Holding on to 4G phones will soon be akin to having dial-up modems in an age of high-speed internet. And I believe this spells trouble for one of the world’s most recognizable companies: Apple. Apple’s iPhone is one of the most recognizable consumer products in history. I’d bet that many of you reading this have an iPhone in your pocket. Apple’s newest family of iPhones – expected to launch by the end of this year – will not be 5G-enabled. And according to a research note from Barclays, Apple might not even have 5G phones by 2020. That means that we wouldn’t see the first 5G iPhone until 2021. Apple has always been a late adopter. It waits until it can pretty much ensure a consistent experience across all phones before launching a feature. But there will likely be more than 100 markets around the U.S. with 5G networks by the end of this year. And those smartphone users aren’t going to wait around until late 2020 (or even later, if the Barclays report is right) to get 5G phones. That’s a problem for Apple… iPhone sales contributed to 60% of its revenues in Q4 2018. The bottom line: The company will struggle this year and possibly next year. It will lose market share to other mobile phone companies that offer 5G devices. That may be hard to believe. After all, Apple is a behemoth of the tech world. Last August, it became the first publicly traded company to hit $1 trillion in market capitalization. The market cap is now down 24% from its all-time high of $1.1 trillion. You may think that makes it a great bargain. But as I’ve shown you, there’s more pain ahead for Apple. Of course, it’s up to you which stocks you decide to buy. But let’s just put it this way: I won’t be recommending Apple to my readers anytime soon. But plenty of other tech companies are rushing full speed ahead with 5G. One of my favorites is poised to soar 10x as 5G picks up. And you won’t have to wait years and years to start making money. 5G is happening right now. The best stocks will start climbing in a matter of months – and 99% of investors will miss it. Don’t be one of them. Get the full story here. Betty asked, “What if global warming is real? Shouldn’t we be doing all we can to combat it, just in case?” My response would be that as individuals we should try to not be wasteful, but we SHOULD try to raise the living standards for everyone. Poor people don’t have time or interest in environmental concerns. That only comes with some level of prosperity. But what we absolutely should NOT do is give more control to the corrupt elite who flew over 1700 private jets into Davos a few years ago to discuss what restrictions they should impose on the rest of the world in the name of global warming. For you can be sure that they would not apply those restrictions to themselves but would delight in imposing draconian restrictions on the rest of us. 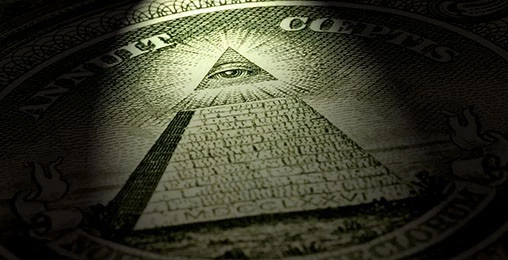 For the elite, global warming is an excuse to claim even more power over the rest of us. Whether it’s really happening or not is incidental to them. If climate change is so real, why did the man who fathered it change his position? If it’s his baby, it would take a lot of extra facts to change. Why did they tell us in the ’70s that an ice age was coming? Why are there parts of the world that are actually adding ice? Why did one of my friends who lived in Alaska tell me they found woolly mammoths and they would feed the meat to their dogs? Wouldn’t that mean it was once warm there? Best wishes. Climate change is indisputable to anyone with any ability to think for themselves. Some of you have been brainwashed by some of these moronic opinions. Too much Fox News and Doug Casey. Get in on our climate change debate at [email protected].